The Majority of these songs haven’t been heard since the albums debut in 1991, the record was considered dark and brooding to some, but has always had a special place in the heart of Inspirals Fans. So while the Inspirals are out packing out big venues playing all the hits with their pre-1989 Singer Stephen Holt, Tom has decided to take a high road and celebrate the the fans obscure ‘lost album’. Supporting Tom will be Rochdale’s finest new band The Brightsparks – whose combination of harmonies aggression and pure pop sensibility, akin to the Libertines at their best and Rory McKee a singer-songwriter from Omagh whose song writing abilities combined with a rich baritone make him a good choice by Mr Hingley for first support. 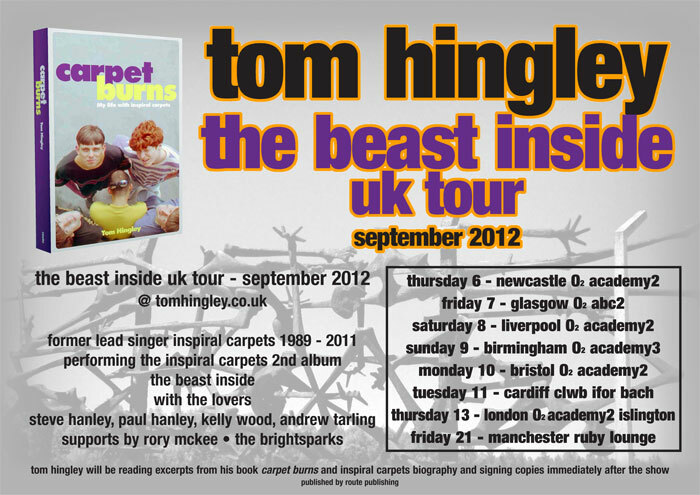 Tom Hingley’s Inspiral Carpets memoir Carpet Burns is published by Route. Some Girls’ Mothers played to a packed house at Hebden Bridge Town Hall on Sunday 1 August. Here are a few photographs. To see more, please visit the Some Girls’ Mothers Facebook page. Click here. Click here for more details on Some Girls’ Mothers. Some Girls’ Mothers are back on tour and the book is now available in paperback, eBook and audio book. Click here for more details on the book and dates. Best friend or bete noir? How does the mother/daughter relationship colour women’s lives? In Some Girls’ Mothers six authors share their stories. By popular demand, SOME GIRLS’ MOTHERS will be touring the UK throughout 2010 until spring 2011 with a series of readings, discussion and workshops about the themes raised. Last year’s tour was a great success, revealing a level of emotional engagement and audience response unprecedented for tours of this nature.